Put-in-Bay: Wait, This Place is in Ohio? Home » Blog » United States » Ohio » Put-in-Bay: Wait, This Place is in Ohio? How much do you know about the Great Lakes? Maybe you know that they straddle the border between the U.S. and Canada. Perhaps you know that there are 5 of them. Maybe you can even rattle off their names: Superior, Michigan, Huron, Ontario, Erie. But did you also know that the Great Lakes have islands? Because they do. Thousands of little ones, in fact, and a handful of larger ones that are actually inhabited. I was actually just recently riding a bike on the Toronto Islands in Lake Ontario, but I have to admit that I'd never really had much interest in the islands closer to home. Lake Erie – which borders my home state of Ohio to the north – has some fantastic islands just a few miles off the mainland. But I had only ever been to one. So, before I waved goodbye to Ohio for an extended period, I decided I had better get at least one more visit under my belt. And what better place to finally visit than Put-in-Bay? Put-in-Bay is a village on South Bass Island, with a permanent population of right around 150. During the summer months, however, the population swells by 10- or 20-fold as young twenty-somethings and retired couples alike flock to Put-in-Bay to party and relax in equal measure. Now, usually I wouldn't be interested in a place known for its party-resort atmosphere; I'm not a fan of being around people who are so drunk that they can't even form coherent sentences. But Put-in-Bay is so much more than just drunk college kids. It's got yacht clubs and crepe restaurants. It's got more golf carts than cars. It's even got a national memorial to commemorate a naval battle that took place on Lake Erie in 1813 (yes, really). And yes. IT'S IN OHIO. Despite being small, there's actually quite a bit to do on the island, especially in the summer months. You can't miss this 352-foot tower – it's one of the first things you'll see as you approach South Bass Island from the mainland, and can be seen from various points around the island. Perry's Victory and International Peace Memorial commemorates the Battle of Lake Erie, one of the most significant naval battles to occur in the War of 1812. The monument is dedicated to those who fought in the battle, and also celebrates the long-lasting peace among Great Britain, Canada, and the U.S. (who were all involved in the War of 1812). The monument is managed by the National Park Service, and the visitor center does a great job of explaining the Battle of Lake Erie. But the real highlight is taking the elevator to the top of the tower, which gives fantastic views out over Put-in-Bay and Lake Erie. On a clear day, you can see Canada. If you're looking for a lunch spot overlooking Lake Erie, head to The Boardwalk. You can find good seafood dishes here (Lake Erie is known for its perch and walleye! ), as well as great views. 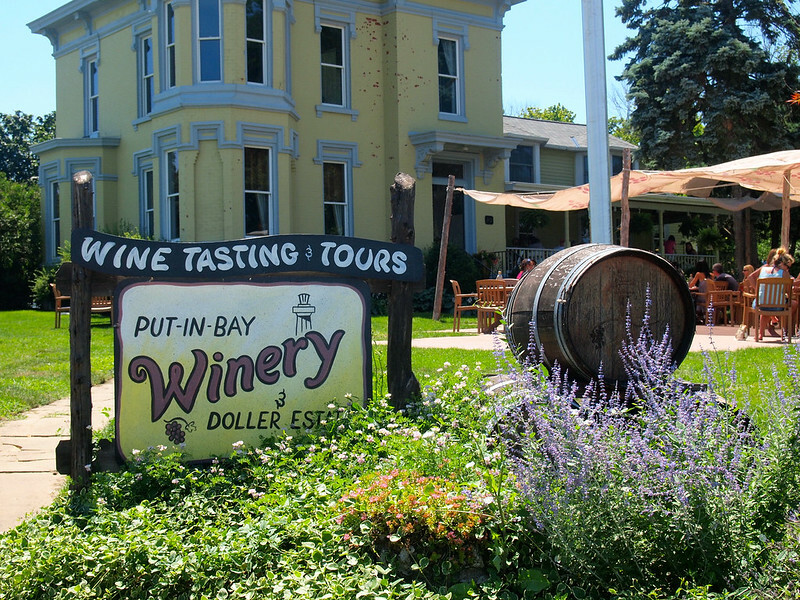 Yes, Put-in-Bay has wineries! 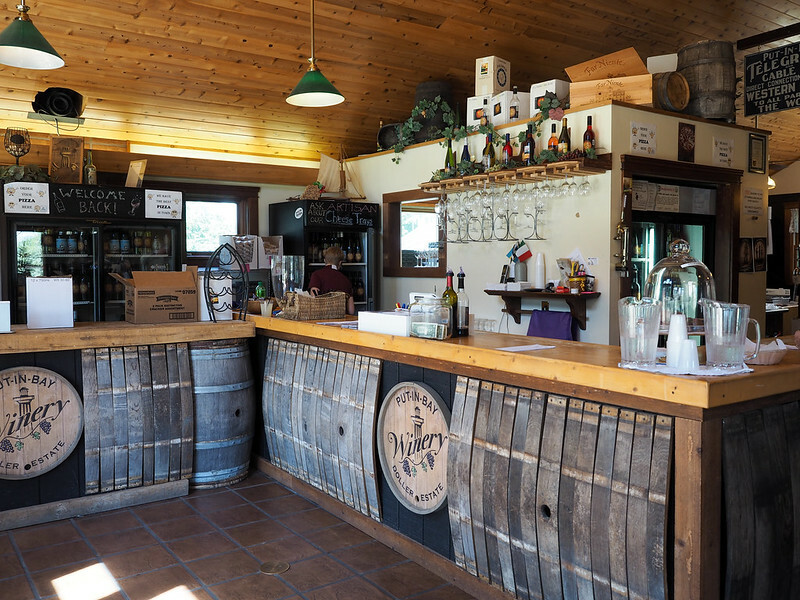 Sip some delicious locally-bottled wines at either the Put-In-Bay Winery or Heineman's Winery. Perry's Cave is exactly what it sounds like – a cave! 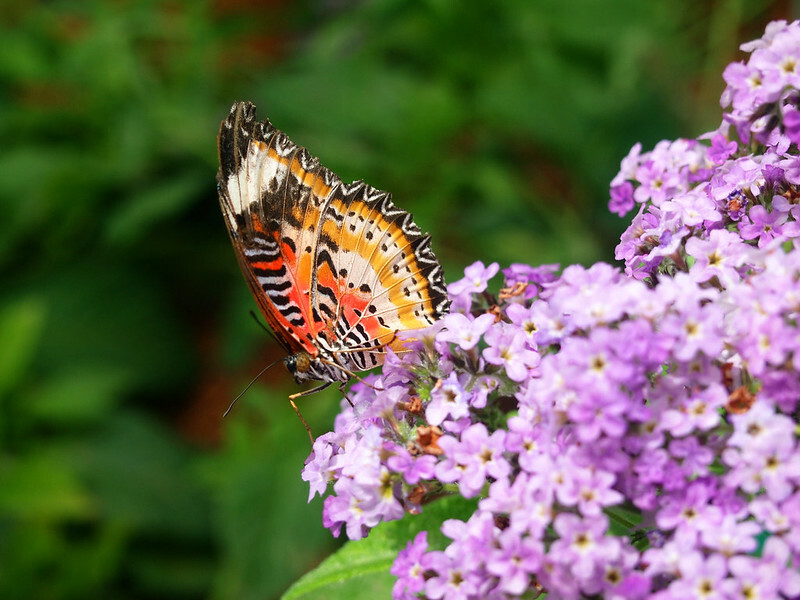 You can go on underground tours of this limestone cave, or enjoy some of the other things the family fun center has to offer, including mini golf, gem mining, a rock wall, and a butterfly house. 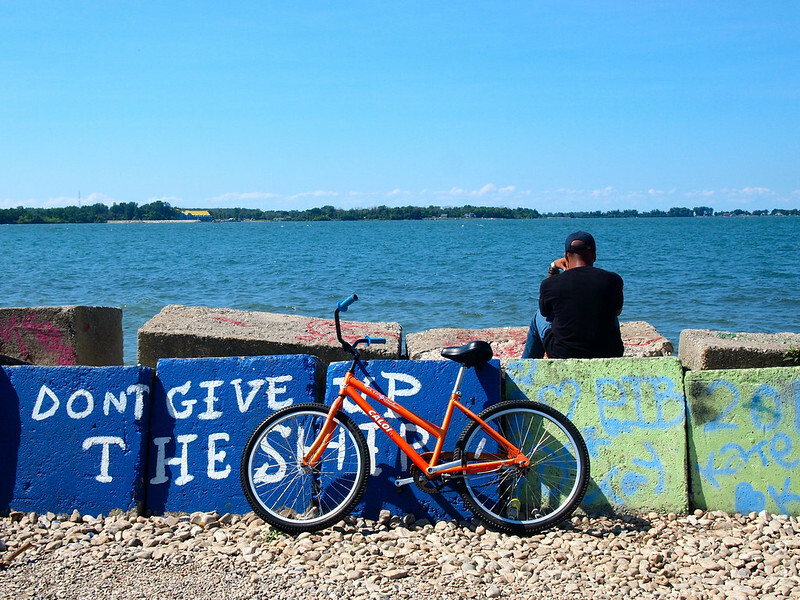 One of my favorite ways to explore the Lake Erie Islands is by bike! Several places in Put-in-Bay rent out bicycles by the hour/day, or you can bring your own over from the mainland. You can also ride an old carousel, go parasailing, rent a kayak, or just spend some time wandering around the town on foot. A trip to Put-in-Bay doesn't have to be all about drinking and partying (though there are certainly plenty of places to do that, too). I'm almost ashamed that it took me this long to finally discover Put-in-Bay. It's a really great summer getaway destination, and it's no wonder lots of people flock here on the weekends. Getting there: You can catch a ferry from either Catawba Island, Port Clinton, or Sandusky. You definitely do NOT need a car on the island, though you can technically pay to bring yours over on the ferry. People-only ferry tickets start at $7 each way on from Catawba Island, and that ferry takes about 40 minutes. 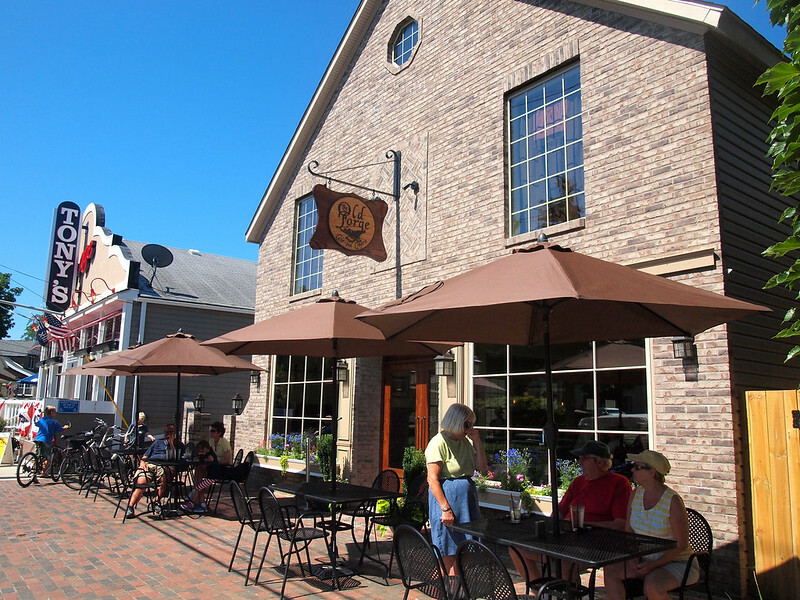 Where to eat: Check out the Olde Forge Cafe and Creperie for breakfast, grab a fresh seafood lunch (perch and walleye are both local) on the Boardwalk, and have dinner at The Goat (a bit outside of the downtown area). 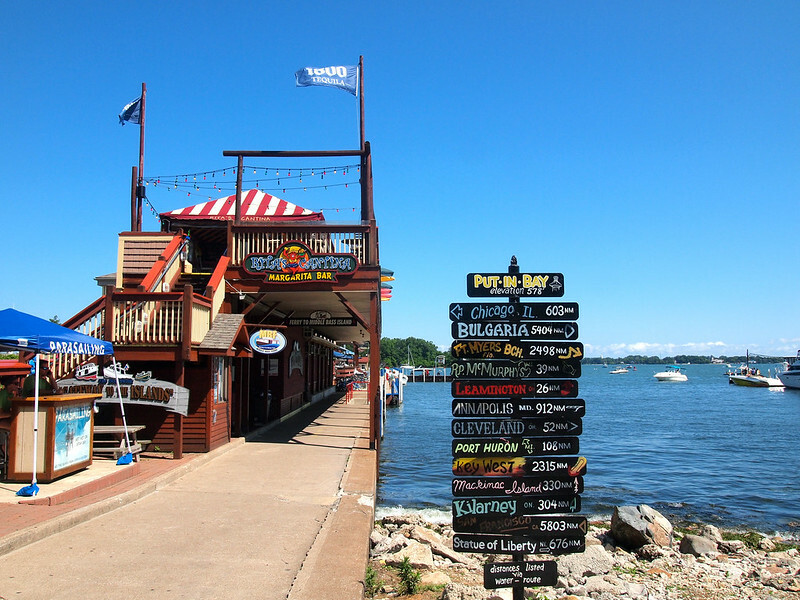 Where to drink: There are plenty of bars and clubs in Put-in-Bay. A lot of them can be fun, but also crowded. If you want to avoid the drunk crowds and go somewhere more “local,” check out Topsy Turvey's on the waterfront. Bring an extra dollar bill with you to staple to the wall. Is Put-in-Bay a place that YOU would like to visit? As someone from southeast Michigan, Put-in-Bay has always been on my radar, but I’ve sadly never been. I need to get myself there! Looks beautiful. Yes, you definitely should go, Akatuki! Makes a fantastic weekend trip in the summer. We had a similar experience on Painted Rock National Seashore in Michigan’s Upper Peninsula. It’s not a place we had ever heard of before, or expected to find in MI, but the area is like the Grand Canyon on one side and open ocean (Lake Superior really) on the other. Amazing place. That sounds really cool! I haven’t heard of it, either, to be honest… but you have me intrigued! We re-visited Pictured Rocks National Lake Shore last month…and Put-in-Bay earlier this month. I’ll be posting about both of those places through the coming months myself. We stayed at a bed & breakfast inn on Put-in-Bay. There are many of them on the island and a great alternative for those who want to experience the more quaint and quiet side of the island. We loved the Boardwalk and the Goat, too! Good to know there are plenty of good BnBs there! This post makes me miss Ohio. I actually went at a very different time of year (in September). We were the only ones in the pool and were there for a bachelorette party. It was fun to get out of the city and feel like you have just escaped. It does have a reputation for being the party island. I have also been to Kelley’s Island, which is a little more tame and more family oriented. I have a post about a day visit a couple years back. Unfortunately, it was October with rainy and cold weather. I took very few pictures. I’m sure when I come back and read this in a month I will be missing Ohio, too! Put-in-Bay definitely does have that party reputation, but I was surprised to find plenty to do on the island that didn’t involve alcohol. I loved it! I need to tack on a visit to Kelleys Island next time. I’ve been there once before, but it was when I was quite young and I don’t remember much about it. I visited Put-in-Bay for a day trip once a few years ago. It really was a fun place! I remember poking around the island in a golf cart – good times! 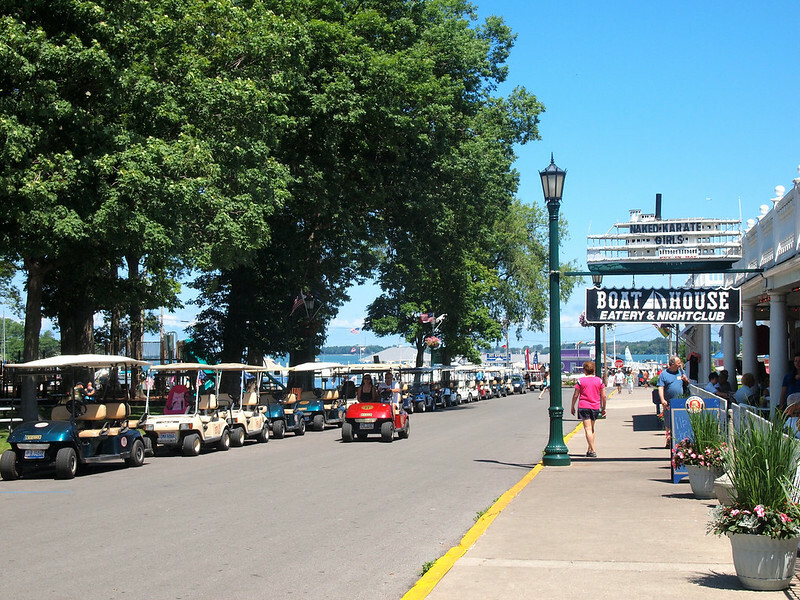 Ah yes, so many golf carts there – probably the best way to see the whole island. 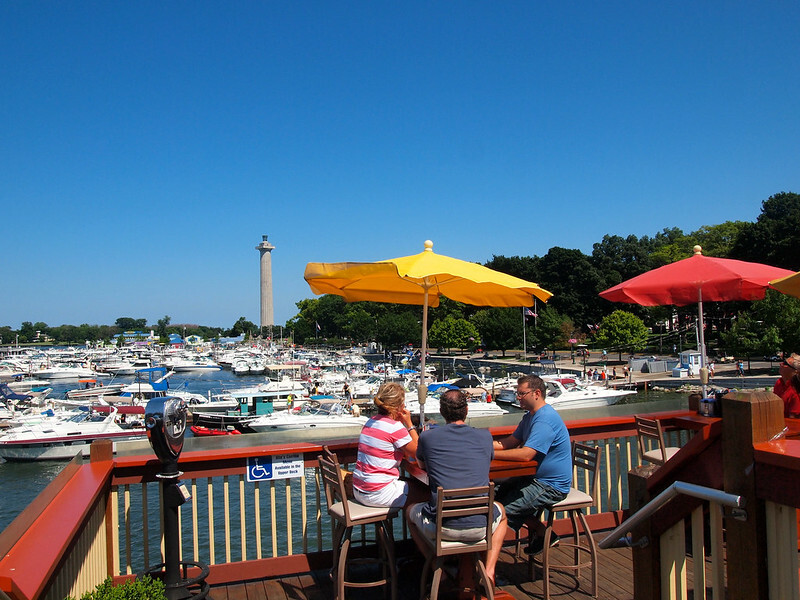 I’ve seen and heard only great things about Put-in-Bay from many people…really makes me want to visit! You definitely should go sometime if you can! Those pictures make me want to hop in the car and go here instantly. This looks like a perfect getaway for this Philly girl. Love that fourth picture with the signs pointing to everywhere. It’s officially made my list! Awesome the hear, Akatuki! A bit far from Philly, but I would definitely recommend it for a weekend if you ever find yourself in Ohio! I love put in bay bought a summer home their with my best friend 19 years ago now 6 kids between us we love our little getaway kids get on their bikes and go to the pool and to the yacht club for sailing class their is a lot for everyone to do. glad you got to enjoy it! Having a summer house there would be lovely! The best part – your dogs are welcome most places! We just had a group getaway with 25+ other Newfoundland owners, and our dogs were with us every minute. It’s fantastic. Didn’t know that, but that’s great! This makes me miss home so much! I grew up on the north coast of Ohio and looooooved the islands; from camping as a kid to more “adult adventures” as a college kid to bringing back my kids now when we visit. I brought my husband (a Utah native) and he could not believe that these islands existed and were such a well kept secret. The best place to eat is the Boardwalk, the lobster bisque is to die for! Thanks for promoting one of my favorite places on earth! Agreed on the Boardwalk having great seafood! And I’m happy to share this awesome slice of Ohio with the world! Thanks for highlighting one of my favorite places in Ohio. The trams are also another way to get around the island in style. You are most welcome. I loved it there! As someone from northern Ohio who grew up going to the islands every summer, I’m always shocked by the number of people, even Buckeyes, who know nothing about them. Put-in-Bay is a favorite. Kelley’s Island, with its state park and awesome white-sand beach, is another fav. And riding the ferry over to any of the islands is the best of all. I know! I knew about the islands (and have been to Kelleys before), but for some reason never went very often. I will definitely need to change that in the future! I have been to Put-in-Bay several times to party and be one of the stupid drunks. Recently, my band played there so we were there for three days. There’s only so much drinking I can do, so we decided to check out a few other things. We went to the monument because my husband had not been there yet. We also went on the island tour in the trolley. It was extremely informative and a great way to see all of the island. Near the tour start is a great little ice cream shop. That was probably the highlight of our trip. I am excited to try Old Forge on our next trip in August. That’s great that you took time to see a bit more of the island! Good to hear that the trolley tour is good. And yes, definitely try the Olde Forge next time! Breakfast there was sooooo good! I grew up in Port Clinton and we used to go over in our boat to Put-In-Bay and Cedar Point. I loved fishing and swimming off the boat. Needless to say, I miss it terribly. The entire area is a hidden gem. I hope someday to buy a summer home there, or maybe just move there permanently. That must have been so nice! If I lived up there, a boat would definitely be a necessity! Very cool, I had no clue about the islands, but this spot looks wicked chill. Love breezy calm towns, especially with Victorian style houses like that! Yes, it’s beautiful! Kind of a weird mix of chilled-out and party central, but cool nonetheless. We go to Put-In-Bay every year as a family. We have gone to party and we have gone and taken the kids for a family getaway. Plenty to do both ways. The island is also home to Heineman’s Winery, which is Ohio’s oldest winery. They are celebrating their 125th year, I believe. The Crystal Cave is below it and you can tour the cave and he winery. It is a must do each time we visit the island! Good to hear you’ve experienced both “sides” of the island, too. I didn’t realize Heineman’s was the oldest winery in Ohio! That’s cool. I’m from Erie, Pennsylvania and I’ve never been here! Though, in my defense, I moved away for college 15 years ago and never turned back. I might just have to visit this island next time I make a trip home! 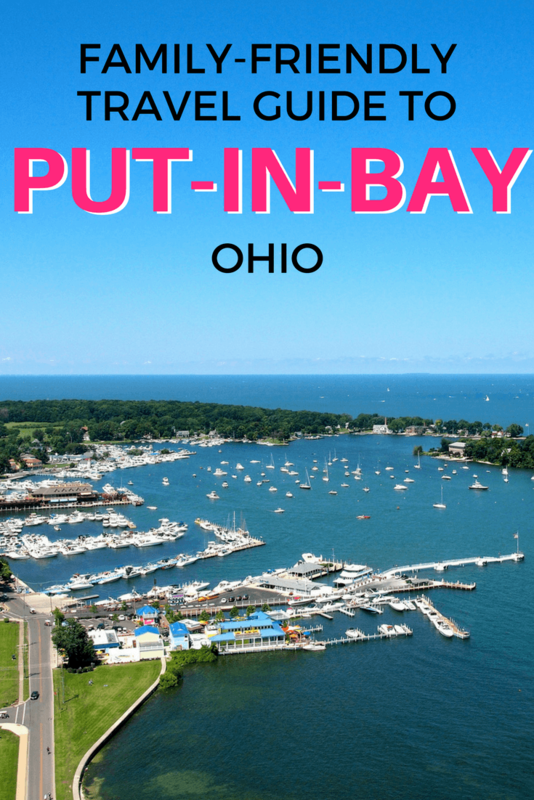 Seriously…you’re from Ohio but have never heard of Put-In-Bay? Yikes. But one thing you might want to mention is that you can get to Put-In-Bay using the Jet Express as well. It leaves from Port Clinton AND Sandusky. The Miller Ferry is nicer and cheaper, however the Jet Express is faster and will get you to downtown where all the action is. Miller Ferry means then taking a bus or ride to the downtown area. Also, I’d check out Kelly’s Island as well. The Jet Express in Sandusky will take you to Kelly’s Island and Put-In-Bay so you can check out both in the same day. I didn’t say I’d never HEARD of Put-in-Bay. I just said I had never BEEN there. I’ve actually been to Kelleys Island before, but associated Put-in-Bay with partying, which I’ve never been into. Hence why it took me so long to visit! Yes, the bicentennial should be really cool! The Bay is a great place it was more fun when I was younger but as my sister who worked for the Miller Ferry told “visitors” If you can’t have fun on PIB you can’t have fun!! My “official visitation rules are the Monument, one of the two caves and a mandatory visit to the pool that’s left from the Victory Hotel (which was the largest wooden resort in the US) where men and women first swam together in the same pool. Thus the beginning of the debauchery on PIB LOL!! Put an Island in your life!! Haha, I agree with your sister! It would be difficult to go to PiB and not have a good time. I grew up spending my summers at Put-in-Bay, my family had a cottage out near the West Shore that my Great-Grandfather and Grandfather built themselves. The family sold it back in 2000 after we all left Ohio for other places, but for me the island will always be “home” no matter where in the world I’m living! Great pictures and I’m glad you were able to see past the “party” rep to see the real hidden gem the islands are! I was glad to be able to see the “other” side of the island, too. As a longtime resident, married to a 4th gen islander, and a business owner, it’s fantastic to see such an articulate, well-written opinion on our island paradise. As mentioned, too many times PIB gets dragged through the muck related to it’s “adult” activities. All the businesses we own cater to families, so it’s nice to hear good things about those. Thank you for visiting and for inspiring others to come see us. Put-in-Bay really is a great place and I’m glad that you touched on the beauty of the island because there is much more than some individuals preconceived notion that it is just a party island. There are plenty of attractions and events for families and people that do not wish to indulge in the party scene. A new family friendly event to the island this year is Perry’s Victory Triathlon & Duathlon on Sunday, August 11, 2013. The event also features a Kids Duathlon and a Kids FUN Run. 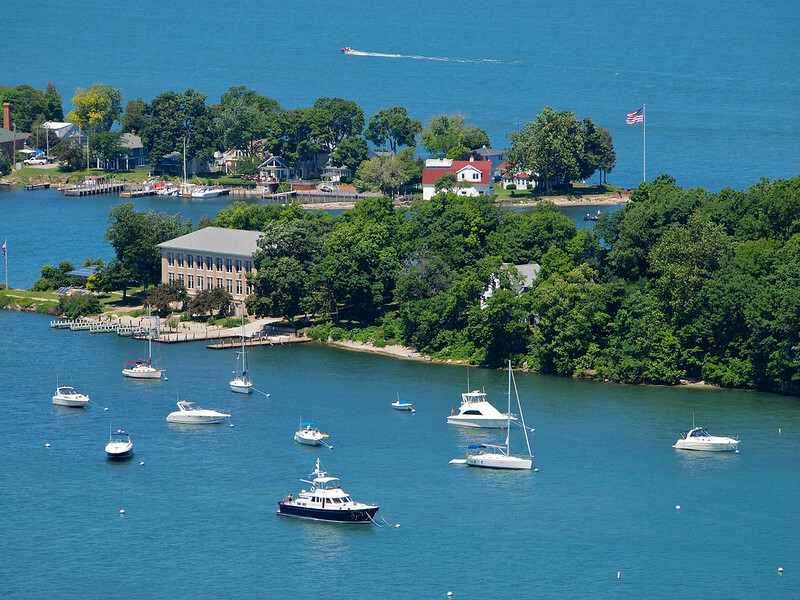 If you have never been to Put-in-Bay this is a great opportunity to explore the island. @DangerousBiz thanks for the great article it was awesome reading that you had a nice experience on the island! I was so happy to discover the alternatives to partying on PiB that of course I had to write about them! Lake Erie looks beautiful – I’d love to go. If you ever have the chance, take it! The Great Lakes are pretty awesome. Wow. And you’re sure this is in Ohio?! 😀 I have family there and visit at least once a year and have never seen anything like this before. Gorgeous. I promise that it’s in Ohio!! Next time you go to visit your family, maybe you should head up to the lake! My in-laws live in Ohio so this place will definitely be going on the summer visit itinerary! It definitely should! I’m sure you’d love it. Fair enough, John. I don’t know what it used to be like, but I personally quite enjoyed it! Then John, by all means, don’t. I visited Put-In-Bay as a young 20 something back in the 70’s for the partying. Then again in the 90’s with the kids and family for a vacation. Great memories both times. But in the last few years we revisited PIB to see our son, who took a summer job there. We stay at a great Bed & Breakfast, “The Getaway” each time we go now. It is just a block or two off the beaten path and we always have a wonderful experience. For my “60th” birthday the only present I wanted was to spend the weekend on PIB with our 3 children, all in their 20’s now. My son gave us a personal tour, in a golf cart, of all that the island has to offer. Historic monument & museum, family activities, carousel, camping, golf course, caves, wineries, and a ton of restaurants, shops and so much more. We stopped at a few restaurants for appetizers and drinks then parked the golf cart (need a Designated Driver) and walked to visit a few more spots and ended up at the “BOARDWALK” for a fantastic dinner. One of the best and most memorable birthdays I have ever had. Our son started out working on the island helping to open “THE KEYS”, a new group of restaurants and shops with “THE BOARDWALK GROUP”. Now he is General Manager of THE BOARDWALK and loves being part of PIB and working for the Booker family. Thank you DangerousBiz for sharing Put-in-Bay. Next time on the island stop in and see my son Mike. I’m very happy to share cool places like this, especially when they are so close to home for me! Nice article, thanks for sharing. It highlights a lot of what goes on there during midweek. However, let’s be realistic and let people know that weekends are a completely different animal. Most places even recommend not to bring kids on weekends when you call for reservations! The hotel that you mentioned in your article as being recommended turns into a puke contest on the weekend and the rooms are so outdated and disgusting, we found mold in our room when we stayed there in 2013. There were so many bugs in the wading pool that we dared not let our kids in, and we were kept up until 4am with loud drunks. We have visited multiple hotels on the island and that is the absolute worst one ever. But on the flipside, your recommendation for The Goat Soup & Whiskey is spot on! Best food and coolest staff on the island. It used to be Pat Dailey’s restaurant/bar back in the day and we enjoyed it then as much as now. We go there every time we visit Put-In-Bay. Don’t forget about the chocolate café just downstairs for dessert and ice cream! Perhaps I just have a different perspective on hotels after staying in questionable hostels all through Europe and Asia… haha. We WERE actually there on a weekend, and I still felt like there were plenty of family-friendly things to do; you just have to avoid the party bars! It’s pretty fun! Can get kind of messy at night with all the drunk people, but you can avoid that scene if you want to. I’m from England and, on a road trip in 2011 (for theme parks) my wife and I visited both PiB and Kelley’s in the same day, via the JetExpress from Sandusky. An excellent trip, we arrived at PiB at about 10-ish in the morning and wandered towards Perry’s Cave and that area. Excellent attractions – didn’t do the Crystal Cave but enjoyed Perry’s Cave (though the steps down aren’t for the infirm), the adventure golf and the little car museum. Didn’t manage the butterfly house either though. Then walked to the end and back again. Coming from England, it’s a bit of a novelty to see what we perceive as an “olde tyme American town” – plenty of wooded areas to explore, nice old houses with porches for sitting on, trading gossip and sipping lemonade… like something out of a 50’s or 60’s coming-of-age movie. Definitely on our list of “it’d be nice to move there someday” places. Of course we didn’t experience any of the drunken antics that apparently ensue, but we were only there for a day. But if you want drunken antics come to the UK – my local city still has inebriated people going round, throwing up, getting into fights in the back of ambulances at 6am (I know, I sometimes have to go to the train station at that time for business trips and will be doing the same in a few days) and have had a pair of drunks try to start a fight with me at 6am before in the city centre, as well as coming back from a restaurant at night. 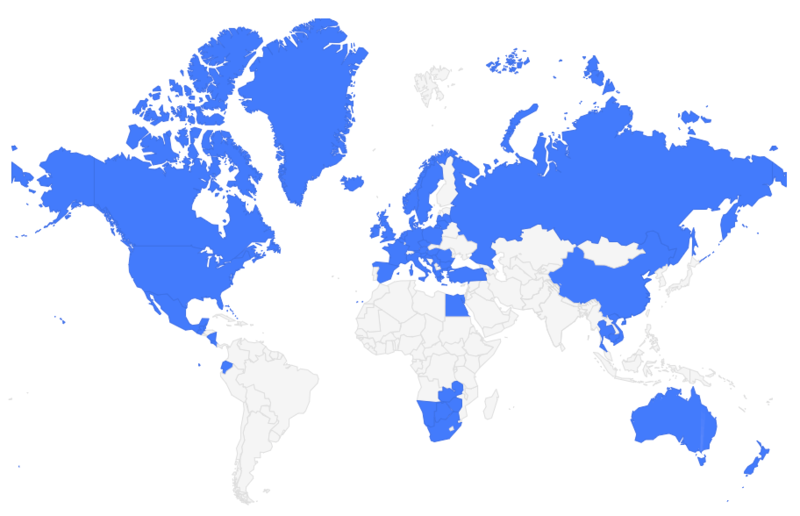 You can probably count yourselves lucky that it’s too far away for your average Brit. For a reference, look at what we get up to in places like Magaluf. Kelley’s Island was also very pretty – we went there and walked to the beach for a swim and back. Probably has a prettier downtown area than PiB, and is reputedly the more family-friendly of the two. I have so many amazing childhood memories of Put-in-Bay and Kelleys Island! I grew up in Cleveland, and we went every summer (along with Cedar Point, of course!). The summer camp I went to was on Kelleys Island, and I managed to spend most of my time out on the water tubing, skiing and sailing. It’s such a gorgeous place to visit, and I love that it’s right on Lake Erie. That lake gets such a bad rap, but it has a ton to offer. 🙂 Thanks for the memories! I agree – this whole area of Ohio often gets a bad rap, but there really is a LOT to do around here! I’m hoping to go back up to the islands again before the end of the summer! Hi Akatuki! I was just mentioning to Katie Aune that I’m headed here next week and she remembered that you loved it! I’d never heard of it until now. I’m kind of excited to go in fall. Any tips?! 🙂 Thanks! Hey Lisa! Fall is a great time to head up to the islands – less drunken party crowds. Lol. I was just up there last weekend, actually! Food-wise, try the perch tacos at The Goat (or actually anything there – it’s delicious). And make sure to have breakfast at the Old Forge Creperie. I’m not really into the bar scene up there, but Mojito Bay can be fun because they have swings instead of bar stools, and often have live music (though I’m not sure how hopping it’ll be in cooler weather). You can also rent a bike or golf cart to get around the island if you want to explore a bit – there are a couple state parks that are nice. I would also usually recommend going up Perry’s Victory monument, but it’s closed for the season now (I think they’re doing some repairs on it). If you have any other questions, feel free to shoot me an email! My husband’s family has a house here and I’ve been wanting to visit! Love the photos. Ooo you should definitely go!